Alois was born in 1914 in Germany. He was born to a family of six children. His father was a school teacher and he took them on monthly trips to shrines. Two of Alois’ brothers and Alois became priests because of their devout father’s example. Alois was ordained a priest when he was 25 years old in 1939, only a month before the beginning of WWII. 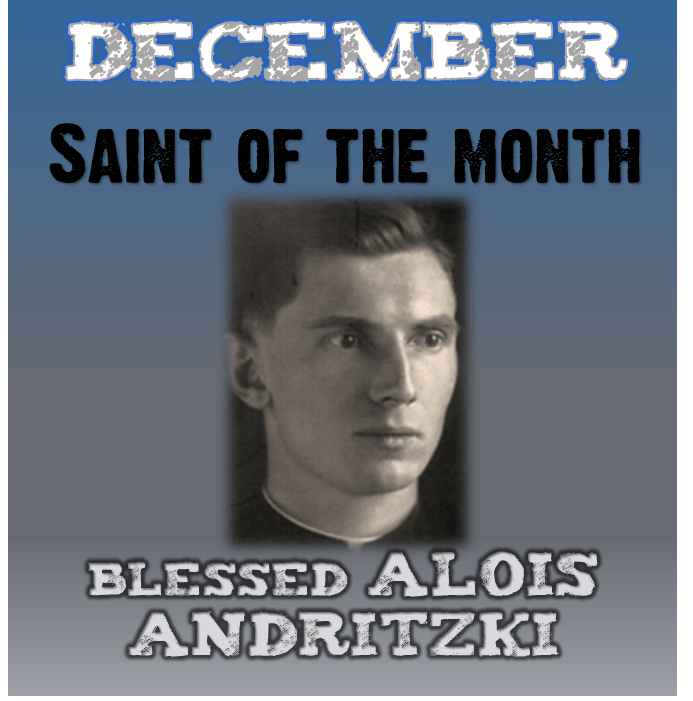 He was a fervent priest and although the Nazis tried to stop religious organized activities, he continued to help people in Christmas time and Advent by having a Nativity play at his parish because he believed the people should have the freedom to practice their faith. He was not afraid to speak openly against the Nazi regime and their ideas. Days after Christmas, the Getstapo interrogated him and he was arrested. Ultimately Father Andritzki was sent to the German concentration camp of Dachau. A fellow prisoner remembered him for his kindness and faith in the midst of the camp’s horrors. People who spent the time in the concentration camp with him said he was like a bright light in the midst of so much darkness. A talented musician and artist, he painted an image of Jesus, Mary and Joseph in the manger for a makeshift chapel in the prison barracks for the Christmas season. After a year in the concentration camp prison, he fell ill with typhoid fever. His last request was to receive holy Communion, but the guards refused. The Nazis put him to death in 1943, when he was only 28 years old. He was declared a martyr and blessed by Pope Benedict in 2011.